Sprinkle sliced strawberries with sugar. Beat whipping cream in large bowl with electric mixer on high speed until soft peaks form. Stir in liqueur if desired. Fold cream into ice cream. 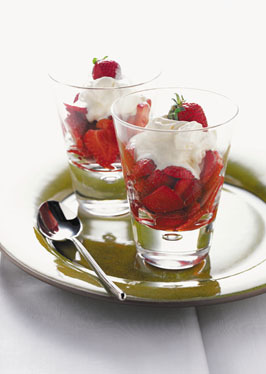 Spoon sliced strawberries into 6 stemmed glasses. Top with Amaretto Cream mixture. Garnish each with a strawberry and serve immediately. Leftover Amaretto Cream mixture can be frozen for later use. About 10 minutes before serving, remove the mixture from the freezer and allow mixture to become slightly soft. Drop by dollops onto your choice of fruit or dessert.